First I’d like to say a hearty THANK YOU to LEGO, Bricklink and everyone who donated or purchased items for this years fundraiser to make it such an enormous success! 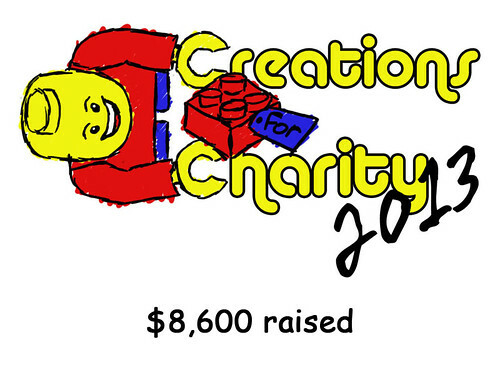 Without the kindness of the Lego fan community this fund raiser would not be possible. This is the 3rd year I have participated in the Creations for Charity fundraiser, but the 1st year I was personally affected and understood exactly how much this fund raiser really means to the people who receive these toys. My best friend of 20 years lost 100% of their homes, belongings and cars in a house fire back in August. Since then many members of the Lego community donated loose bricks and sets and Creations for Charity set aside some funds which I was able to use to repurchase each of the 4 Bogner children their favorite LEGO set. These donations have meant the world to these children who literally lost everything except the clothes they were sleeping in. I still smile when I think of how happy the kids were when they received the donations and the subsequent hours they have spent building castles, trucks and Zanadu sized houses. In addition to the loss experienced by my friend Colorado has experienced 2 major natural disasters in the last 6 months, one of which made international news. The loss of homes from the Black Forest fire and 200 square mile flooding in Northern Colorado was close to 2,000 homes with another 19,000 seriously damaged. Because of this enormous loss our local Toys for Tots has had more requests for toys this year than the last 5 years combined. This being my first year as a distributor I was not sure what to expect. I found that I had a lot of fun purchasing the sets and really enjoyed talking to people about the charity when I was asked why I was buying so much Lego. In total I was able to purchase 132 sets with my allocated funds and the Toys for Tots volunteers were all smiles when I dropped them off. They said that Lego is the most requested and wished for toy consistently every year, no matter what the age range. So again, thank you to everyone and my fellow coordinators for making this year such a success and giving back to those in their time of need. Have a safe holiday, a Merry Christmas and a fantastic New Year! This year Creations for Charity went north! Not all the way to Santa, but it felt like it for many kids. I had donated and purchased things in the past and I was I ecstatic to be asked the coordinate this wonderful charity into my home country of Canada. In Canada LEGO isn’t nearly as cheap as US, it’s not as expensive as other parts of the world, but it’s definitely a high end toy, so I knew that the toys donated would be that much more special here in Canada. With all the money raised from the sale of creations, and to occasional chats, we raised a phenomenal amount. But even before money started rolling in, I knew I had to start making the most of whatever deals and hook ups I could get – as LEGO isn’t always cheap up here. Calling in some favours Adam M smuggled me a trunk full of LEGO form the states and basically gave it to me for next to nothing. I also had some helpers from my friends at ToroLUG who were all on the lookout for deals! By November I was feeling pretty good with 4-5 banker boxes of sets averaging below 50% retail. But the like the proverbial Christmas miracle , LEGO generously donated about 20 boxes of LEGO. Getting the LEGO from FedEx was a story all by itself. 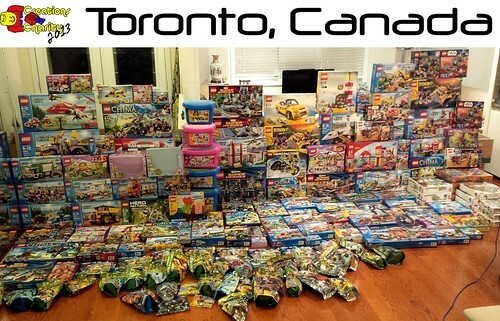 In the end the the combined C4C purchased sets and the LEGO donations was a jaw dropping 220 sets! But who to donate to? 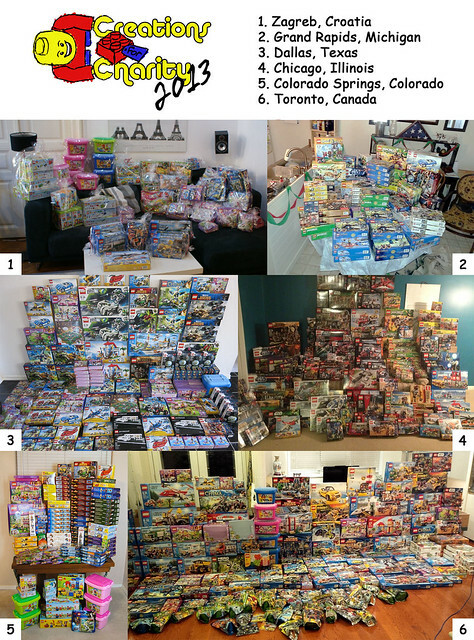 This was all new to me, we have several toy drives in Toronto, some run through the city, massive children’s hospital, fire/police departments, news/radio stations – part of me liked the idea of getting some free press for AFOLs.. but a lot of these drives are pretty well known and supported. For C4C’s first foray into Canada I really wanted to make a big impact and I looked for a under served recipient which really needed help. After asking around we settled on Holland Bloorview Kids Rehabilitation Hospital – it’s the largest children’s rehabilitation hospital in Canada. What’s a rehabilitation hospital you ask? Well it’s a hospital that specializes in dealing kids / youth with disabilities and conditions. Ranging from things that children were born with or those that suffered a traumatic injury. What really broke my heart was hearing how ‘regular’ families have their world turned upside down after a traumatic injury – kids that used to have full lives now have to deal with new realities. Where they’re not even worried about what toys they might be getting, they’re just trying to get back to some semblance of normality. And what really made me stop and think is what if they have siblings? While the parents are focusing all their energy (and money) helping one, the other(s) are inevitably left out. So it was an easy choice. It’s an easy way to make their lives slightly better, but giving some wicked LEGO sets to them. They had already identified roughly how much they needed to help the families, plus some buffer to hold over for ’emergencies’ … we had a lot left, thanks to buyers like you and good folks at LEGO. We had SO much left over, we decided to go around the corner, to Sunnybrook Hospital – Canada’s largest Maternity Hospital. What’s that you ask? it’s when there are newborns might have complications, or early births etc, they aren’t necessarily as developed, and this could lead to problems later on in life. And you know what’s a great way to develop fine motor skills and get a leg up in life? Yup. LEGO. The neonatal intensive-care unit (NICU) has a long term program to make sure children get the help they need, including disadvantaged families, and much like every year they are of course looking for help stuffing trees with presents, so we were happy to oblige.